We are conveniently located on Grand Ave in San Marcos just south of the Las Posas exit on Highway 78. There is parking in front, and in back of the building as well as truck parking on the side of the complex. Make an appointment today to get your Commercial Driver’s Physical – quick and easy, with no hassles. We are in compliance with the May 2014 Regulations so you can be assured your physical is certified correctly for a long time. At Executive Medical, we will gladly answer any questions you may have prior to your exam. Our friendly staff will do whatever it takes to help you. Call Us Today at 760-290-3552. 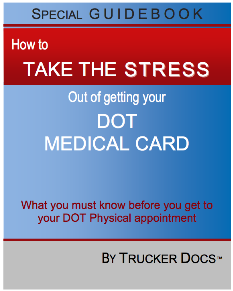 Bookmark this page to Executive Medical for your DOT physical.